Pigeon peas are small, round to oval, mostly cherry-red colored seeds in the legume family. However, they come in other color variations like yellow, brown, variegated, etc. Pigeonpeas are thought to have originated in India where they recognized as red gram, and currently grown as pulse crop throughout the tropics and subtropics of Asia, and sub-Saharan Africa for their nutritious dry seeds. Botanically, the seeds of pigeonpea belong to the Fabaceae family in the Genus: Cajanus. Scientific name: Cajanus cajan (L.) Millsp. Pigeon peas (red gram), split. The pigeon pea is a drought-tolerant, perennial, but mostly cultivated as annual, erect shrub. It grows well in wide range soil types, varying from sandy to heavy loams. Small, rust-brown to yellow flowers appear in racemes, which develop into elongated fruit pods, enclosing 2 to 8 seeds separated from each other in the pod by slight depressions. The pods, like in other legumes, opens along a seam on either sides. Raw green seeds are ovoid, measure 6-8 mm in diameter and turn brown, red, patterned black as they dry depending on the cultivar type. As in other beans and peas, pigeonpeas too are an excellent sources of vegetarian protein. 100 grams of dry seeds contain 343 calories, and 21.70 g or 39% of recommended daily values of protein. Red gram peas contains good amounts of dietary fiber; provide 15 g or 39% of fiber per 100 grams. Dietary fiber works as a bulk laxative, which thereby protect the colon mucosa by decreasing its exposure time to toxic substances as well as by binding to cancer-causing chemicals in the colon. Total isoflavone antioxidants in red gram peas is 0.58 mg. Isoflavones have been found to reduce post-menopausal cancers and osteoporosis. Pigeion peas are gluten-free food items. They particularly preferred as gluten-free food alternatives in gluten-allergy and celiac disease patients. They compose good amounts of B-complex vitamins like folates, thiamin, pyridoxine, pantothenic acid, riboflavin and niacin. Most of these vitamins works as co-factors for the enzymes in carbohydrate, protein and fat metabolism. Dry seeds carry 456 μg or 114% of daily required value folate. Raw, green pigeonpeas contain 173 μg of folates. Folate, together with vitamin B-12, is one of the essential co-factor for DNA synthesis and cell division. Adequate folate in the diet around conception and during the pregnancy may help prevent neural-tube defects in the babies. While raw green pigeonpeas hold 39 mg or 65% of DV of vitamin-C, dry peas does not contain any of this vitamin. Furthermore, they are incredible sources several essential minerals. 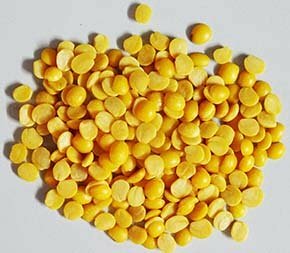 100 g of dry pigeonpeas hold copper-117%, iron-65%, manganese-78%, phosphorus-52%, selenium-15%, calcium-13%, and zinc-25%. Moreover, they are also very good sources of potassium. 100 grams hold, 1392 mg or 30%. Potassium is present inside cell and body fluids, which counters pressing effects of sodium on the heart and therby decreases blood pressure. Like in peas and some beans, raw, mature but green seeds of pigeon pea can be used as vegetables. Whole dry or split seeds employed as pulses in many parts of Southern Asia, and Africa. Choose cleaned, dry, whole or split peas packed in bins or bags in the grocery stores and wholesale markets. Avoid insect damaged, broken, mold-inflicted seeds. To store, place whole dry beans in plastic/steel containers away from moisture and heat. Whole seeds can keep well for several months if preserved in air-tight bins. Raw, green pigeon peas can be kept in the home refrigerator for 2-3 days and shelled peas used like vegetables. Do not deep-freeze the whole pods as they sustain chilling injury. In most of the Indian households, split red gram preferred over whole peas in the cooking. Soak split peas in water for 30 minutes. Whole seeds may take 4-6 hours to soak. Although soaking is not mandatory, it quickens overall cooking time, removes anti-nutritional compounds, and enriches flavor. Pressure cooked for 10 min with soaking; 15-20 minutes without soaking. Avoid overcooking which turns them into pureed. Red gram used in soups and dips, or as mixed dhal. Split pigeon peas (red gram or arhar/toovar dal) are one of the most sought after pulses in the Indian households. They feature in many traditional Indian dishes with seasonal vegetables, herbs and spices. In the southern Indian and Maharashtra states, pureed split pigeon pea paste used as a filling in sweet stuffed bread (puran poli) recipe. Pigeon peas are most liked pulses in the West Africa. Fiofio with taro (cocoyam) recipe is a traditional dip served with rice. In Jamaica where they are known as gungo peas, raw green pigeon peas used in the rice-pilaf preparation. In India and Pakistan, arahar ki dal and palalk (spit pigeon pea and spinach curry) is a popular recipe served with flat breads/rice. Unlike chickpeas and red kidney beans, pigeon peas digested easily, and may cause less intense gastritis and flatulence problems. (Medical disclaimer). <<-Back to Legumes from Pigeon peas. Visit here for an impressive list of vegetables with complete illustrations of their nutrition facts and health benefits. Pigeonpea-plant guide United States Department of Agriculture.-pdf.